Easy to use with one hand only. See more and make better decisions with optimal display options provided by the Drager UCF 7000 thermal imaging camera. The camera is intrinsically safe (ATEX zone 1) and offers the maximum level of safety and reliability in potentially explosive atmospheres. 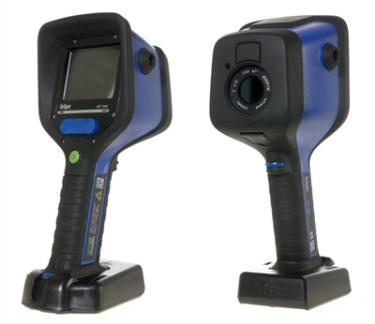 MADE FOR PROFESSIONALS - Thermal imaging cameras by Drager are valuable tools for orientation when fire, smoke, and darkness make navigation difficult. Designed to maintain your orientation to see where you are going as well as for finding persons or hotspots. Whether "indoor fire fighting" or "searching for a person" - various tasks can now be mastered optimally with the help of the new generation of Drager UCF thermal imaging cameras. The Drager UCF 7000 provides a clear plus when it comes to safety and reliability, ease of use and decision making assistance for demanding firefighting jobs. The camera is equipped with innovative functions to meet and satisfy today's requirements for professional search and rescue and firefighting personnel. And while the Drager UCF 7000 is very easy to use, it also delivers excellent image quality. Application-specific displays provide more clarity and facilitate assessment of a situation. COMFORTABLE ONE-HAND OPERATION - Using the Drager UCF 7000 means one hand is always free: an invaluable plus and added freedom of movement for the user. The compact design and well-balanced low weight of only 1.4 kg (3 lbs) make the camera easy to operate with just one hand. The "application switch" makes it possible to use the camera safely and to utilize its functionality to the full extent even in highly stressful situations. A very sturdy attachable "crawling plate" permits the user to brace himself or herself on the ground without letting go of the camera. Also offering various carrying options for optimal carrying comfort. BETTER OVERVIEW, MORE DETAILS - The Drager UCF 7000 delivers excellent images to firefighters even if visibility is less than optimal. A resolution of 160 x 120 pixel as well as a 2x zoom provide a detailed impression of the situation. When the current image is always right in front of your eyes, rooms and the immediate vicinity are searched quickly and safely. The risk of overlooking a detail is especially likely and a problem in difficult situations. Thanks to the "application switch" (application-specific operating modes), the Drager UCF 7000 makes it possible to optimize the image display of the camera for the specific task at hand. For example, the camera's display can be optimized for finding persons or finding sources of fire. This additional selection provides firefighters with better insights in any situation. EXTENDED FUNCTIONALITY - Optimized image processing provides a quicker overview in just seconds. The Drager UCF 7000 even makes it possible to "see around corners" if the equipment limits the freedom of movement or the field of view. The "snapshot"-function is used to provide a temporary freeze-frame of thermal image, which can then be viewed on the display. This allows personnel to examine and check out even difficult to access areas quickly and safely. The integrated laser pointer significantly simplifies pointing out the position of hazards - such as hotspots - to other team members and clearly defines the path of attack. The Drager UCF 7000 always offers a high temperature resolution - even in hot situations. This makes it possible to detect cooler objects such as people even in the vicinity of a fire with best possible resolution. Integrated video- and sound recording functions as well as the ability to record single images are part of the Drager UCF 7000 delivery scope. EXTREMELY ROBUST - This camera is reliable even in the roughest and toughest environments and with the most demanding applications. Equipped with an almost indestructible housing, the Drager UCF 7000 is heat-resistant and withstands usage-specific mechanical stresses with ease. Due to their high protection class of IP 67, Drager UCF 7000 cameras are resistant to typical conditions encountered during an operation such as water and dust. Modern lithium-ion battery technology yields operating times of up to four hours and provides users with the peace of mind needed during long runs. EX PROTECTION FOR SAFETY - An explosive atmosphere may be prevalent especially for calls where there is no fire. This means the equipment used must not be a source of ignition. The Drager UCF 7000 is the tool of choice even in these types of situations. The device is intrinsically safe and approved for use in potentially explosive atmospheres including zone 1 according to ATEX. STANDARD USB INTERFACE - The Drager UCF 7000 is supplied with USB 2.0 interface by default, which makes it possible to configure the camera (e.g. setting an individual start image) and transfer the thermal image directly to a PC. Recorded images and video sequences used for documentation purposes can also be transferred to a PC. EXTENSIVE RANGE OF ACCESSORIES - The Drager UCF 7000 is shipped complete with USB cable, attachable "crawling plate", and PC software CD. Cadmus Distribution Group Limited trading as: Keison Products, VoIPon Solutions & 4Gon.